Supporters of the Equal Rights Amendment hold their signs high so members the House subcommittee can read their messages. 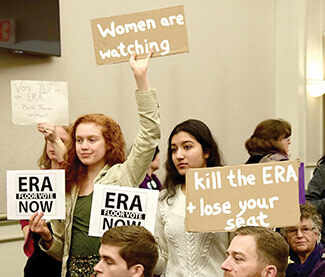 RICHMOND—Brandishing signs that read “Women Are Watching,” “Kill the ERA + lose your seat,” and “Men for Equality,” over 150 women and men crowded into a House committee room Tuesday morning to show their support for the ratification of the Equal Rights Amendment in Virginia. The House privileges and elections subcommittee #1 considered four resolutions to ratify the ERA. Members of the subcommittee were booed and jeered by the gathered crowd, made up of mostly older women proudly wearing purple Ratify ERA buttons, when they voted 5-2 to pass by all four resolutions to ratify the ERA indefinitely.